For general inquiries use the form on the right and for all other inquiries please contact us at curious@muselab.in. Please send resumes and portfolios electronically at curious@muselab.in. Ensure that all document(s) can be opened and printed from Microsoft Word or Adobe Acrobat. The total file size of the document(s) should not exceed 5mb. MuseLAB is an end-to-end design studio; offering a bespoke and leading-edge approach to design. With a precise focus on unique and highly customized environments, interiors and furniture. 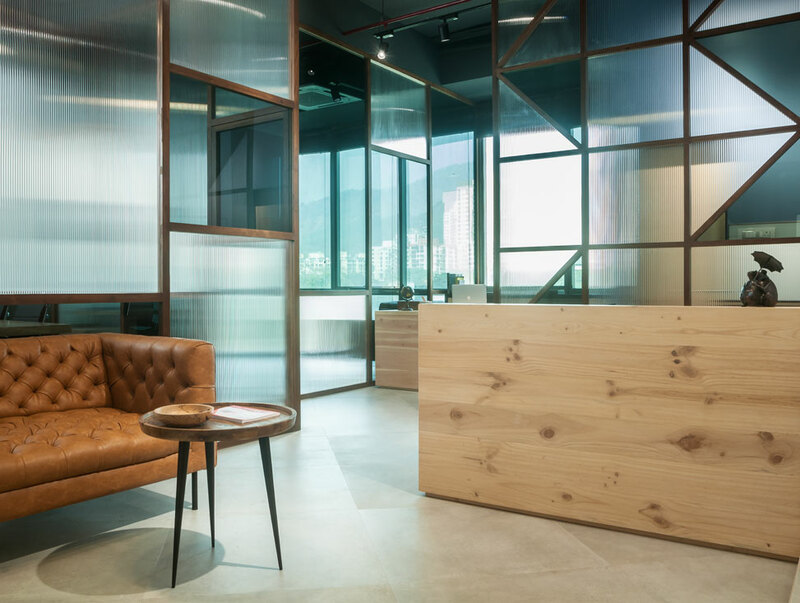 In 2012 partners Huzefa Rangwala and Jasem Pirani founded the studio built upon their shared passion for design. Each space and or product embodies integrity and is created with the same care, skill and attention to detail. 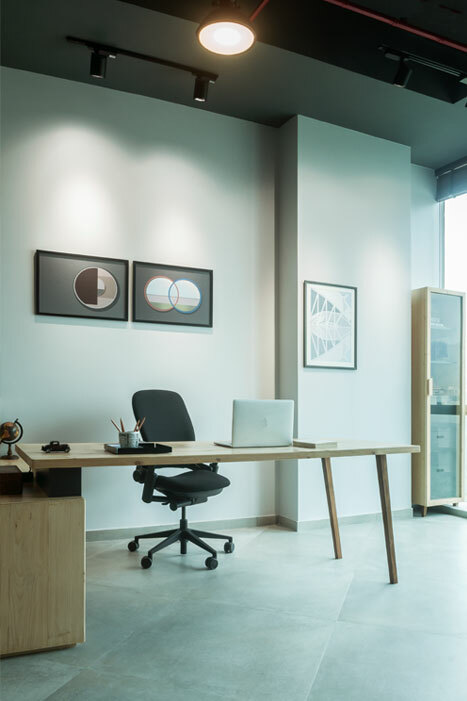 To make this workspace of a private real estate developer in Mumbai feel cosy and luxurious we looked to the décor of homes and home offices for inspiration and combined it with warm materials. This 600 sq.ft office space is embedded within a commercial building that is fronted by a giant window. 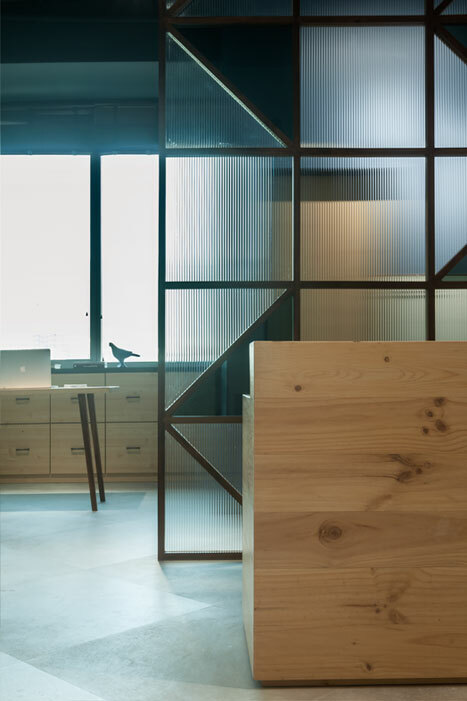 The reception lounge towards the front of the office has a pine wood clad table placed against a teak wood framed fluted glass and black glass partition that masks the pantry and powder room. A lighter chesterfield like sofa and coffee table are placed in the lounge to make the guests and visitors feel at home and at ease. On the left hand side of the lounge area a conference room and the main executive cabin are concealed behind larger panels of fluted glass and black glass. The marketing director’s desk is located at the back towards the window wall and right outside the main cabin. To take full advantage of the natural light from the wrap-around views of Yogi hills teak wood framed panels of fluted glass and black glass have been used as primary materials as partitions between the conference room, executive cabin and the reception lounge area to allow for the natural light to penetrate within the space. These areas are defined by the partitions. A neutral colour palette that consists of light grey vitrified tiles, pine wood clad tables in every space, charcoal painted ceilings with warm teak wood frame glass partitions and comfortable sofas add to the domestic feel of the space.